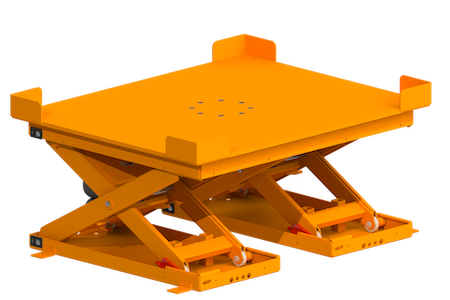 Knight Lift Tables raise loads to the proper ergonomic heights for an operator, helping to create a safe and efficient workplace. They reduce time lost to personnel injuries and help increase productivity. 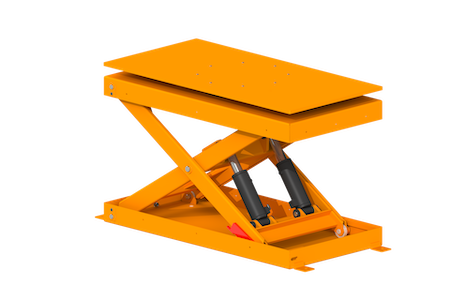 Lift Tables can be designed to fit a multitude of application and come equipped with hydraulic steel fittings. Polished chrome shafts are used at all slide and pivot points to minimize the wear and prolong component life. We also offer optional stainless steel braided hydraulic hosing for increased durability. Maintenance Lock-Out Bars are standard on all Knight Global tables. All tables are inspected and tested before they leave our facility. Tables, Shuttles and Carts are available with a variety of accessories, safety features and equipment. Optional Safety Equipment including but not limited to; perimeter fence guarding, bellows skirting, safety mats, audible signals, light signals, toe guards, special control guarding, etc. are not included unless otherwise stated in the product descriptions. Please check with your state, local or plant safety for requirements. We are happy to quote any and all safety equipment needed to meet your requirements. 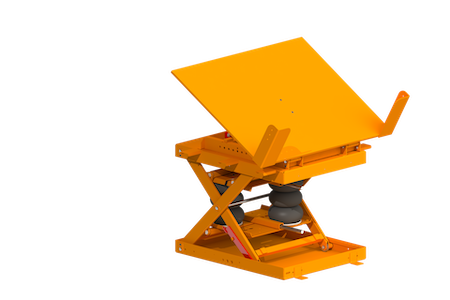 Raises loads to the proper ergonomic height for the operator for a safe and efficient workplace. Heavy Duty Pneumatic Air Bags. Polished Chrome Shafts at all Pivot and Slide Points. Max. Capacity: Up to 8,000 lbs. [3,629kg]. 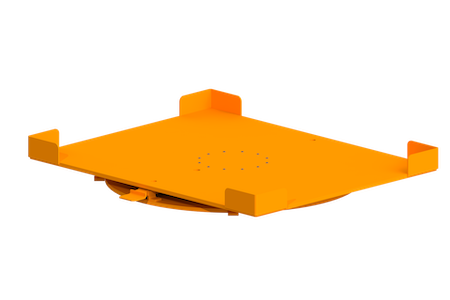 Pit Mounted (Angled Toe Guards, External Mounted Pit Guards or Auto Safety Bars are required). Corner Gusset Tabs (No Extra Charge). Raises and rotate loads to the proper ergonomic heights for the operator for a safe and efficient workplace. 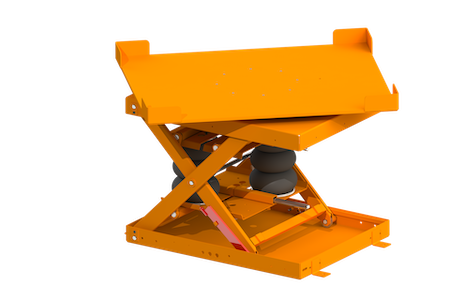 Available with yoke supported caster bearing or a maintenance free 20,000 lbs. [9,072kg]. capacity mechanical thrust bearing. Max. Capacity: Up to 6,000 lbs. [2,722kg]. 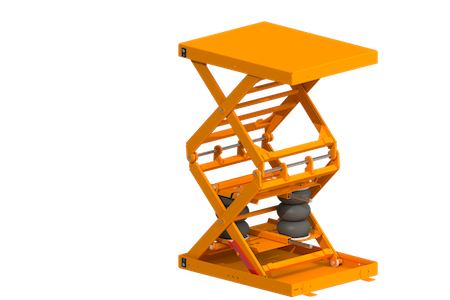 Used when extra lift is needed to raise loads for the operator for a safe and efficient workplace. 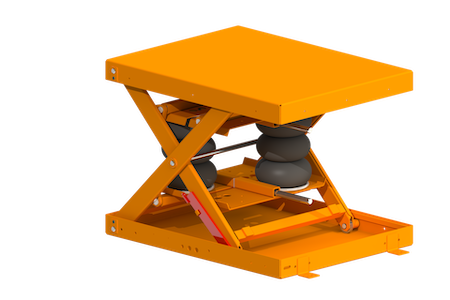 Has a patented air reservoir system that maintains loads at an ergonomic working height during varying weight loads. Max. Capacity: Up to 4,500 lbs. [2,041kg]. Rotating Top Plate utilizing Caster Wheels Only.